Substitute elk and venison as necessary. Mix all venison meatball ingredients together in a large bowl. Shape meat mixture into small meatballs and arrange on a nonstick baking sheet. Bake in the oven for 20 minutes or until done. Heat skillet over medium heat and melt butter. Add onions, mushrooms, garlic and cook until onions soften. Carefully add beef broth to skillet and bring to a low boil. Add sour cream and horseradish to broth and stir together until blended. Add venison meatballs to the creamy broth and serve alone or with buttered egg noodles. Garnish with flat leaf parsley. 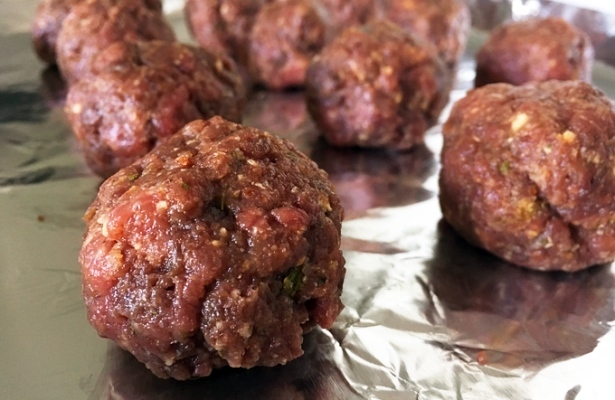 For more information about this antelope venison meatball recipe, please visit NevadaFoodies.com.